Whether you're hunting for history, gorging yourself on gastronomy, exploring extraordinary landscapes, or simply sunning yourself on blissful beaches – holidays in Italy are indisputable proof that size doesn't matter. Showered with effortless charm and cultural riches, you'll want to wave arrivederci to UK shores in no time. The country that has it all, Italy hoards mountains of magnificent masterpieces, ancient architecture and iconic works of art within its boot-shaped borders. From Roman ruins in the capital to the Leaning Tower of Pisa standing precariously askew, feast your eyes upon old-world wonders and marvel at the meticulous craftsmanship of medieval castles. Not to be outdone by human efforts, Mother Nature has been hard at work too. Discover diverse scenes straight out of a fairy tale and find your holiday happy ending amid matchless natural beauty. Romantic rolling hills, glacier-fed lakes, steaming thermal springs, captivating coastlines and magnificent mountains are all part of Italy's DNA – a playground for outdoor enthusiasts. Of course, no holiday in Italy would be complete without tucking into mouthwatering culinary creations! Tantalise your tastebuds with traditional dishes made from only the freshest local ingredients. Mastering both simplicity and sophistication in every bite, wine and dine until your heart's content – or your belt needs a respite. Blessed with blissfully hot summers, Italy is every bit as idyllic as you might imagine in July and August. Averaging temperatures of 30C it's the perfect time to head to the coast, hit the beach and top up your tan. Outdoorsy travellers might prefer the cooler climes of April to May and September to October, when conditions are at their best for hiking, biking and a whole host of other activities. Don't worry though – there's still plenty of sunshine to go around in spring and autumn. As a general rule of thumb, Italy's weather is always warmest the further south you choose to stay. Bucket lists are made for holidays in Italy. You could fill two weeks with non-stop sightseeing and not even begin to scratch the surface! Teeming with national treasures and UNESCO World Heritage Sites, some of the most famous landmarks known to man pepper the picturesque landscape. Break out that wanderlust wish list and make your way around this Mediterranean maestro. The possibilities are endless in this boot-shaped beauty. Mix cultural gems with untouched countryside and you've got yourself an unforgettable recipe for holiday heaven. Abounding in breathtaking natural beauty, Tuscany is a one stop shop for rural relaxation. Hilltop hamlets watch over verdant valleys, dense forests and rushing rivers, and look every bit as dreamy in real life as they do on their postcards. The birthplace of Renaissance, romantic cities and traditional towns serve as a timeless echo of Italy's historic heritage. 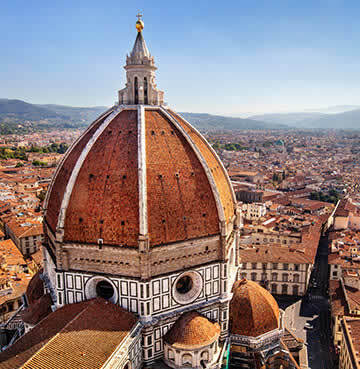 Fantastic Florence bursts at the seams with medieval churches, museums and galleries. Not to mention the famous Duomo, adorned in a decorative mix of pink, white and green marble, which dominates the skyline. Tuscany's next-door neighbour, Umbria, is another natural utopia affectionately known as Italy's 'greet heart'. Here you can wander through serene towns and gothic palaces – admiring the relics of Roman rule. Lesser known Le Marche is one of Italy's best kept secrets. Sitting pretty on the spectacular shores of the Adriatic Sea, with a beautiful backdrop courtesy of the Apennine Mountains - the region is tucked away in a corner of peace and tranquillity. Stretching for 180km along the coast, you'll find more Blue Flags here than anywhere else in the country. Sun-baked beaches are lined with limestone cliffs and lapped by crystal clear waters, so it's up to you to choose between remote coves or wide-open holiday hotspots. The Frasassi Caves are one of Le Marche's most visited natural wonders and not to be missed, comprised of a network of passageways and chambers – there's even a resident bat colony living there. All hail Italy's heel! Here you'll find postcard perfect Puglia perched on its pretty south-eastern peninsula. Lapped by both the Adriatic and Ionian Seas, it's an unspoilt corner of the Mediterranean surrounded by stunning sapphire waters. Whitewashed towns watch over peaceful valleys, while sleepy fishing villages line the sun-bleached sandy shores. Ancient sites are peppered across the region, unveiling traces of Puglia's rich history. 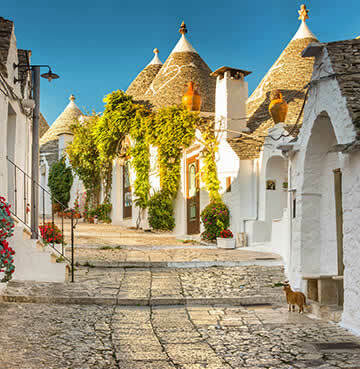 Visit the UNESCO World Heritage town of Alberobello, where a whimsical wonderland of traditional Trulli awaits. Unique and enchanting – it wouldn't look out of place in a children's fairy tale story. Beautiful Bari and its Old Town are well worth a visit too – wander through the narrow alleyways and soak up the authentic atmosphere of the walled city. When you think of Italy, chances are your mind lands straight on the boot-shaped mainland – but the country's beauty stretches out far beyond these borders. Idyllic islands lie in the sparkling Mediterranean Sea, fringed by some of Italy's most spectacular sands and lapped by crystal-clear waters. Rugged interiors are wild and unspoiled, with dramatic scenes sprawling out as far as the eye can see. Mountains tower over atmospheric historical sites, while sleepy villages honour age-old traditions with a whole host of festivals and events spread out across the year. Sicily is within kissing distance of the mainland, a stone's throw from the 'toe' of Italy's boot. 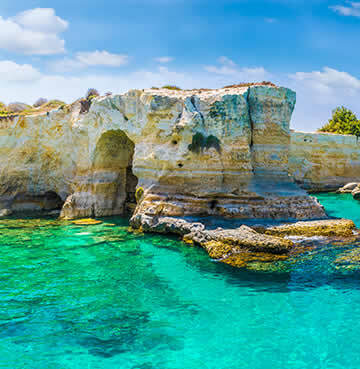 The largest Mediterranean island of the lot, there's a huge amount on offer for visitors. It'd be criminal to travel to Sicily and not get up close and personal with majestic Mount Etna. Visible from pretty much anywhere in the northern part of the island, prepare to be seduced by her beautiful brooding landscapes. Nature lovers will have a field day, from hiking beside volcanic craters and lava fields to cycling craggy clifftops and coastal paths – outdoor activities are in strong supply! 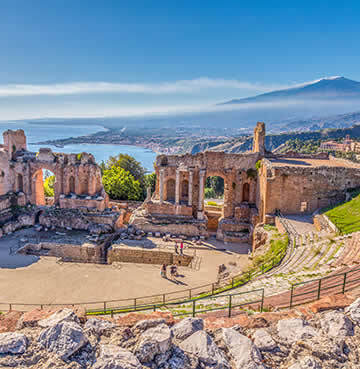 For those who like to mix their adventure exploits with a healthy dose of culture and history, Sicily won't disappoint. Only bested as the biggest Mediterranean island by Sicily, Sardinia's serene shores come in at number two. Closer to Africa than mainland Italy, it's no wonder this dazzling dreamland can feel somewhat distant from traditional Italian culture. Blessed with scorching summers and an enviable laid-back lifestyle, locals might just be the luckiest people on earth! Sardinia is all about the beach. Emerald waters play with soft powder-white sands, inviting you to roll out your towel and settle in for the day. Between buzzing coastal resorts and hidden coves seemingly reserved just for you, you're sure to find the perfect spot for sea, sand and splash. Beyond its beaches, the island's wild, mountainous interior is the ultimate playground for outdoor enthusiasts and will have even the most stubborn sun-worshiper declaring 'bellissimo!' With a blissful blush of romanticism at every turn, Sardinia can't help but seduce. Italy's coastline collection is as diverse as the country it belongs to, but what else would you expect from such an eclectic destination? Lapped by the Mediterranean, Tyrrhenian and Adriatic seas, beautiful beaches congregate in all shapes and sizes along 7,600km of spectacular shores. Whether you're after summer seaside resorts or off-the-beaten-track beauties, the selection of pristine sands on offer cannot be overstated. You'll even be surprised by seemingly rural regions. 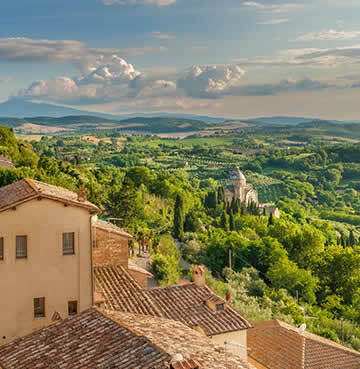 Take Tuscany for example, often associated with rolling hills and rustic towns – this luscious location is no one-trick pony! With many a classic cove stockpiled on its north-west coast from Viareggio to Monte Argentario. Follow your flamboyant flair to the stylish shores of Italy's coveted Sorrentine peninsula, where it's all about glitz, glamour and glittering horizons. The Amalfi Coast and its picture-perfect scenes are adored by visitors and locals alike, with voguish beaches laying beneath towering cliffs covered in chic pastel parasols. Puglia's secluded bays are heavenly hideaways for beach purists craving powder-white sands, with its craggy coves topping most 'best beach' lists. The birthplace of pasta and pizza, the world is forever indebted to the Italians for concocting our favourite comfort food staples. You'll find the crowd-pleasing creations everywhere, so be sure to treat your taste buds to the real deal. Of course menus are overflowing with other mouth-watering local dishes that must be sampled too! Step back from doughy bases and scrumptious spaghetti, and tuck in to a world of flavours. The food you eat will be heavily influenced by the area you holiday and the season you're travelling in. Fish dishes dominate coastal destinations, while inland ingredients are influenced by whatever you see roaming around outside. You can't get much fresher than that! Italians enjoy decedent desserts and sugary snacks just as much as the rest of us. Tasty Tiramisu literally means 'pick-me-up', and it's no wonder considering the delicious delicacy mixes cocoa and coffee (among other irresistible ingredients). The iconic yeast-leavened Panettone cake can be found in bakeries across the country, studded with dried fruits and flavoured with zesty spices – you'd be forgiven for mistaking it for bread. Treat yourself to a slice of authentic Italian life and indulge in a slice for breakfast, don't forget the extra strong espresso accompaniment too! No trip to Italy would be complete without eating your body weight in gelato. 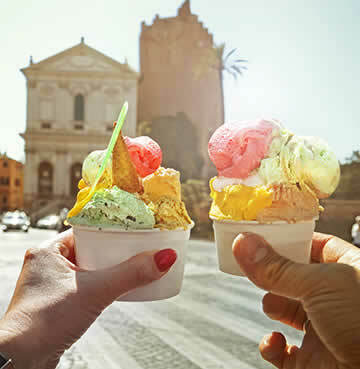 Famous flavours tempt travellers in their droves, from amarena to stracciatella, how many will you feast on? The jury might still be out, but we think this irresistible ice-cream is a must year-round. Born and raised fashion icons have set up shop all over the boot-shaped country, so whether you're top, heel or toe you'll never be too far from high-end designer finery. Industry powerhouses like Armani, Versace, Gucci and Prada set the pedigree for Italian shopping with their exclusive brands. Florence and the Amalfi Coast both have an affinity for luxurious attire and lavish garments, with an incredible shopping scene that's not to be missed. Embrace la dolce vita and treat yourself to some extra special retail therapy – after all, holidays are all about indulgence. If you're more interested in quintessential keepsakes, there are plenty of bucket list buys to bring back with you – from locally made limoncello and stylish sandals in the south to traditional Florentine leather creations in the north. Bag yourself an authentic antique in the form of a wallet, jacket, bag or belt from famous artisan boutiques found all over Florence. Amalfi's aforementioned limencello is the perfect souvenir for reliving those balmy summer evenings spent on the Sorrentine peninsula. Sip nostalgically on a refreshing glass or two and transport yourself back to your villa holiday. If you can bring yourself to part with a drop, delight dinner guests with its tangy taste too! 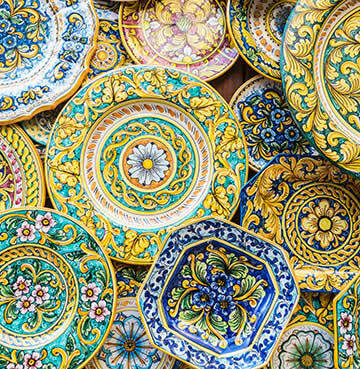 Sicily brings its a-game with a distinct style of brightly decorated pottery called Caltagirone. Prepare for a sensory overload of colour as you try to choose between hand-painted tableware and lovingly crafted ceramics – it's the perfect way to capture the island's charm and bring it back to the UK. When it comes to holiday hauls, Italy has you well and truly covered. The freedom of the open road and Italy's luscious landscapes are a match made in heaven. Well-maintained highways transport you from one bucket list beauty to the next. Explore ancient cities and secret beaches, cruising from traveller hotspot to hidden gems in just a couple of hours. From gently rolling Tuscan hills to hair-raising coastal clifftops, prepare to stumble upon wild scenic treasures as they unfold all around you. Factoring in extra travel time for the inevitable view-point pullovers is paramount too!